Last week, Patrick, William and I drove down to Skövde for the Open Source Systems 2009 conference and OSCOMM 2009 (the “First International Workshop on Building Sustainable Open Source Communities”). From Eskilstuna, Skövde is a three-hour drive best accompanied with the deep base acoustics of a Citroën playing James Brown, The Beatles, random hip hop, and any other classics you can find in Patrick’s freestyle music collection. 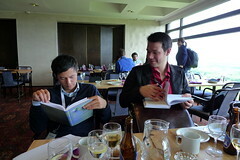 OSS 2009 was a very interesting conference with two engaging keynotes by Stormy Peters and Brian Behlendorf. Aside from these keynotes, the focus of the conference was on analyzing community dynamics and applying models to explain observations. I sometimes felt that there was too much focus on academics (e.g. making a presentation look smarter by using complicated terms, graphs, and models) and too little emphasis on actually presenting a concrete insight or conclusion. As a result, I definitely enjoyed the ten minutes of open questions at the end of each presentation more than the presentations themselves. The OSCOMM 2009 workshop last Saturday was a lot more hands-on, where we had very interesting discussions about building and sustaining communities. Patrick wrote a more in-depth summary of the event. 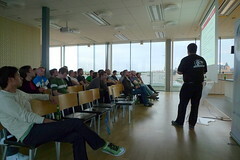 Pictures from OSS/OSCOMM 2009 are tagged with oss2009. This entry was posted in mozilla and tagged mozilla, oscomm2009, oss2009, skövde, sweden on 2009-06-08 by David Tenser. Bli en del av Mozilla Sverige! Är du intresserad av Mozilla och planerar att bli (eller kanske redan är!) mer involverad i Mozillas community? 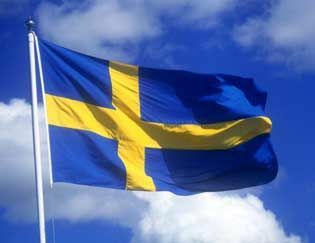 Kom till Stockholm imorgon kväll, tisdagen den 2 juni kl 18:00 och träffa några av oss för att lära dig mer! Eventet är fritt för alla, men vi har dock en gräns på 50 personer som kan komma. Vi hoppas att vi kan lära oss mer av hur den svenska Mozilla-communityn ser ut idag och vad vi kan göra för att få den att växa. Jag kommer att hålla en kort presentation om projektet jag ansvarar för — SUMO, eller support.mozilla.com, eller Firefox Support om du så vill. Det finns massor av sätt att bli involverad i SUMO-projektet så om du är intresserad av det ska du definitivt komma! I am very excited to announce that we will hold a Mozilla get-together on the evening of June 2nd, starting at 6pm at the delightful offices of bwin games in Stockholm. You can register here. 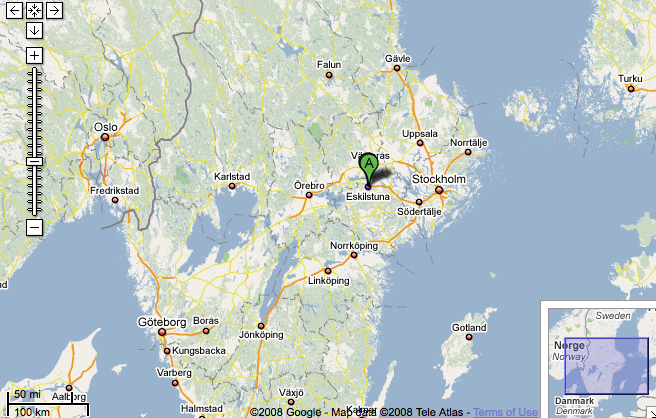 We will be at the offices of bwin games, Klarabergsviadukten 82, Stockholm. This entry was posted in mozilla and tagged mozilla, stockholm, sumo, support, sweden on 2009-06-01 by David Tenser. The reason why I blog today is because I’d like to introduce you all to a guy I recently got to know. His name is Patrick Finch, and he also lives in Sweden (a beautiful country in northern Europe) in the same small city called Eskilstuna. Just like me, he lives quite near the center of the city, close to the Tuna Park shopping center. Intriguingly, he works for the same global company/community as I do — Mozilla. Finally, he’s part of (you guessed it!) the marketing team. That’s just one mile between us! This morning my internet connection wasn’t working properly, so I took a five minute bike ride and worked from Patrick’s home office instead. When most of my colleagues and community friends are on the other side of the globe, having an IRL colleague just five minutes away is an amazing contrast. Say hello to Patrick and pay his new blog Tuna Park a visit! This entry was posted in mozilla and tagged eskilstuna, mozilla, sweden on 2008-09-03 by David Tenser.